Do You Need a ProComm Replacement? 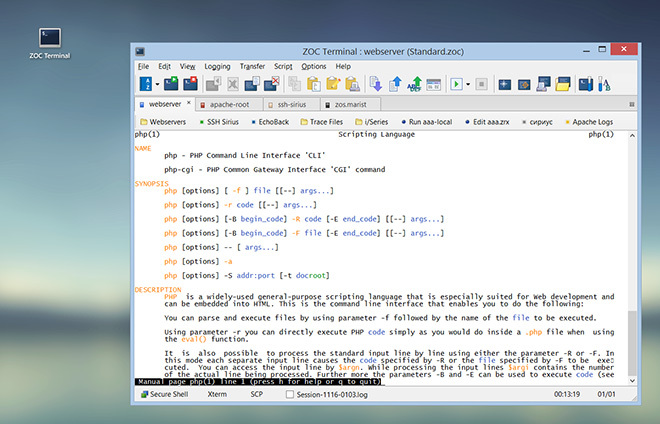 ZOC Terminal is a rock-solid, modern and feature-rich terminal emulator software that offers many emulations, file transfer and other features that are similar to ProComm, so that ZOC can serve as a modern alternative to ProComm. Read more about our ZOC terminal emulator, check its extensive list of features and terminal emulations (e.g. xterm, VT220, TN3270, ...) or look at ZOC's screenshots. Or just go ahead and try it. Start your free 30 days of evaluation today and download ZOC Terminal V7.23.3 now. 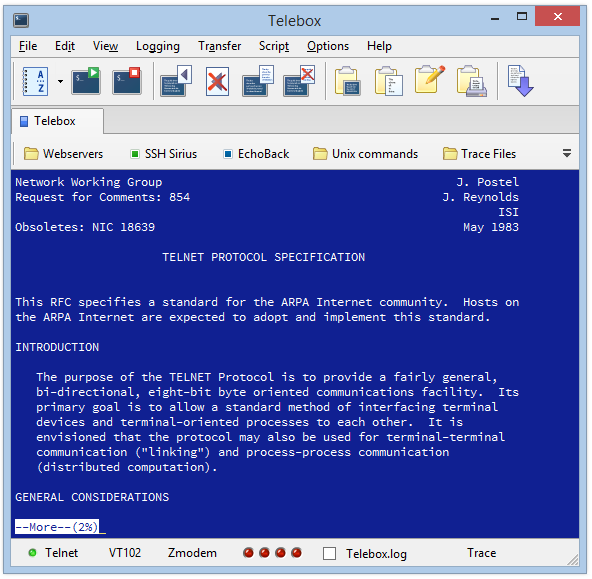 In its time, ProComm was an excellent terminal emulation software that, with the advent of Windows 3.1 and later Windows 95, stole the crown of terminal emulation from the earlier kings of the hill, i.e from the likes of Telix or Telemate who ruled the MS-DOS market. 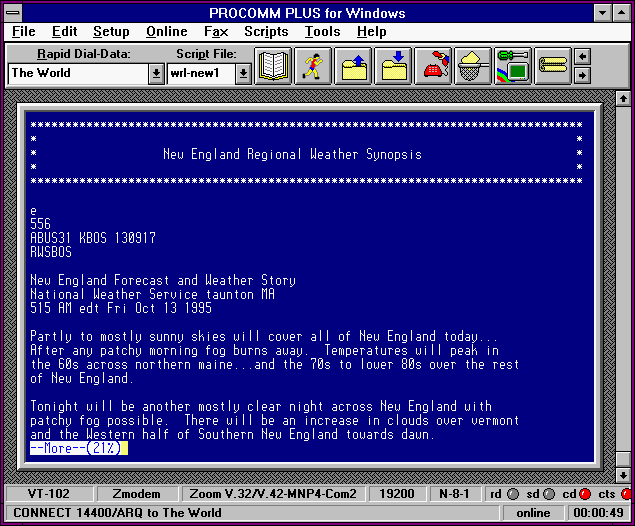 Developed by Datastorm Technologies from 1986 until 1996, ProComm practically owned the market for Windows terminal emulation and probably even was a major factor in the decline of sales the production of physical terminals like DEC VT220 or Wy-50 (their implementation of these emulation types is still superb by modern standards). ProComm even pioneered some early stages of the World Wide Web with a built in web browser. But in later years the product had problems with the transition from 16-bit to 32-bit and became rather crash happy when running on operating systems after Windows 95. Being acquired by software giant Symantec, becoming merely a tiny part of their huge software portfolio, didn't help much either. Finally discontinued with version 4.8, it went into a steep downward spiral. Today ProComm remains a fond memory for those who used it (us among them). But today it is also an anachronism and major source of pain for those who try to maintain a solution that requires to run ProComm on a modern computer. ZOC Terminal was started as a 32-bit software under OS/2 in 1995, which was about the time of the height of ProComm's fame. Over the years, ZOC has undergone many transitions. Offering a Windows implementation in 1999 was a step towards more propularity, when the first cracks (crashes) began to show in ProComm when trying to run it under Windows 2000. Then offering a macOS version of ZOC in 2010 was another major step for ZOC. Unlike ProComm's neglect after being taken over by Symantec and living a live on the back burner of a large software company, ZOC Terminal has been and is under continued development over the last 20 years, still being in the hands of its original and loving developers. ZOC shares many features with ProComm, e.g. superb VT220, Wy-50, and TN3270 emulations, as well as an extensive scripting language, modem and telnet access to hosts. But ZOC also offers modern features like tabbed sessions, a refined graphical user interface, secure shell connectivity and full support for modern operating systems like Windows 10 and macOS High Sierra. In other words, if you are feeling the pain of trying to run a ProComm based solution today, ZOC Terminal will offer an excellent alternative. Read more about our ZOC Terminal Emulator, check its feature list, look at our screenshots or start your free 30 days of evaluation today and download ZOC Terminal V7.23.3 now.